April | 2014 | We've Got Some Issues. “It’s come at last! The moment we’ve been waiting for! 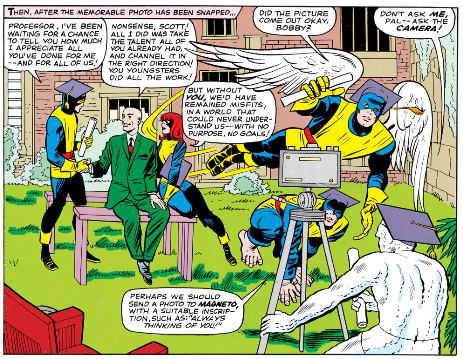 We are looking at the uncanny X-Men, accompanied by Professor Xavier as they pose before an automatic camera on their graduation day!” And so issue 7 begins with caps and tassels, scrolled diplomas, and much handshaking and congratulating. Now that he X-Men have graduated, what new rights and privileges are bestowed upon these strapping young mutants? They’re not just gonna keep fighting and going on the same monster-of-the-week style missions, right? Right? Well, no, something will change. Xavier turns to his team and says that now that they have graduated, he must say farewell. Like Gandalf, Xavier has some “unfinished tasks” that require his attention elsewhere. So, off he goes without explanation, but not before selecting a “group leader” to act in his stead. Xavier pulls aside the natural choice, Scott Summers AKA Cyclops, and walks him through the mansion to the secretive west wing. Xavier introduces Cyclops to a byzantine contraption called “Cerebro” (“from the Latin “cerebrum meaning “the brain”!) explaining that its sole purpose is to scan brainwaves and find mutants. This device is necessary to locate mutants while Xavier is away. The action cuts away to the dark mirror version of the X-Men: Magneto and his Brotherhood of Evil Mutants. Magneto, in full costume, walks a carnival seeking out a mutant we’ve seen before: the vividly named Blob. The next pages are a patent recycling of the courting/fighting of Namor we saw last issue. 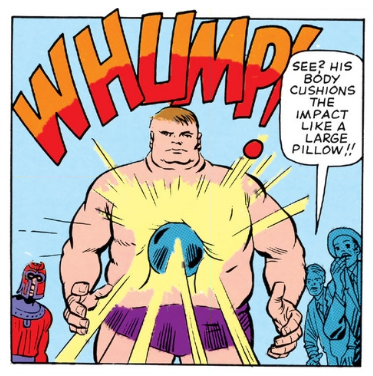 Magneto’s efforts to recruit Blob could use a little finesse (“Blob! I desire to speak with you!”). It’s not the most elegant seduction. Blob rejects the offer to join the BOEM, which causes—what else?—some rough-housing. 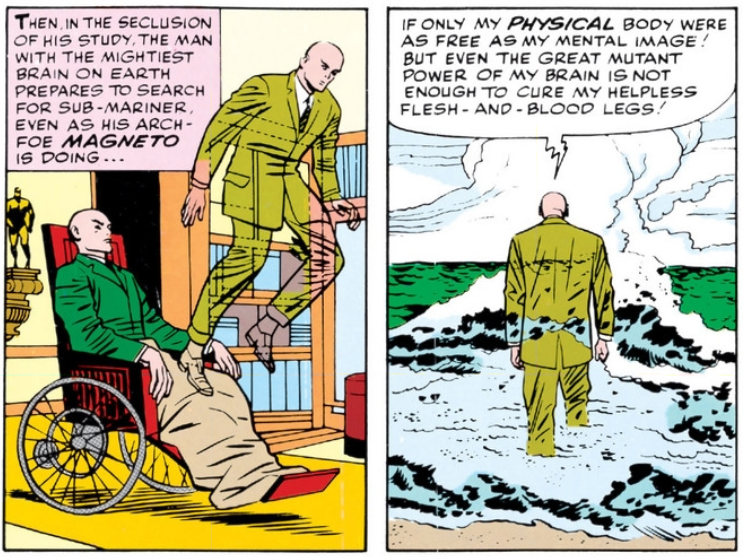 One of Magneto’s assaults on Blob results in an impact that “jars loose part of the mental block which Professor X had previously put over the Blob’s memory–!” Blob, remembering his misadventure with the X-Men four issues ago decides to join the Magneto and his Brotherhood. On the other side of the comic book, the X-Men are at play among the strange and brave frontier of humanity. Hanging in a beatnik club, Beast and Ice Man take in some jazz and a simultaneous “Zen poetry” reading. 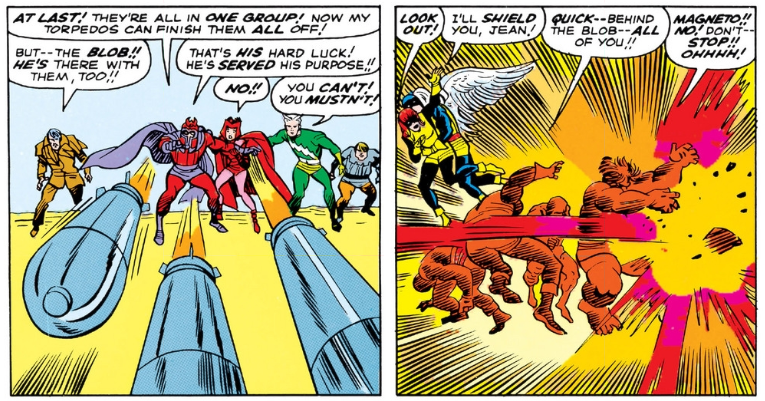 This is as goofy, joyful sequence and it’s sad that it comes to an end so soon when Cyclops summons the X-Men to another battle with Magneto (and now, the Blob as well.) This battle carries on much the way other skirmishes in these books have so far. The X-Men take on a villain or group of villains whose machinations perfectly tee up opportunities to exercise their mutant powers. 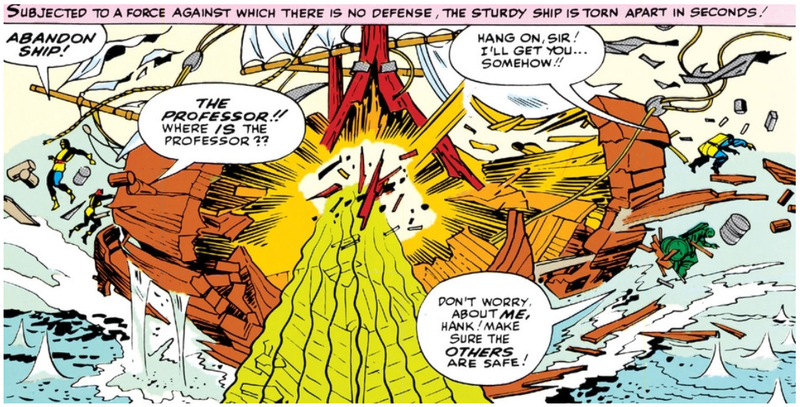 This is a typical X-Men/BOEM battle, but there is a clever ending: Magneto’s plot to take out the X-Men requires the sacrifice of his newest Evil Mutant, the Blob. The X-Men survive, as does the Blob (though he takes three missiles to the gut). Magneto and his team fly off, foiled again. And the Blob’s arc ends on a decidedly sad note. 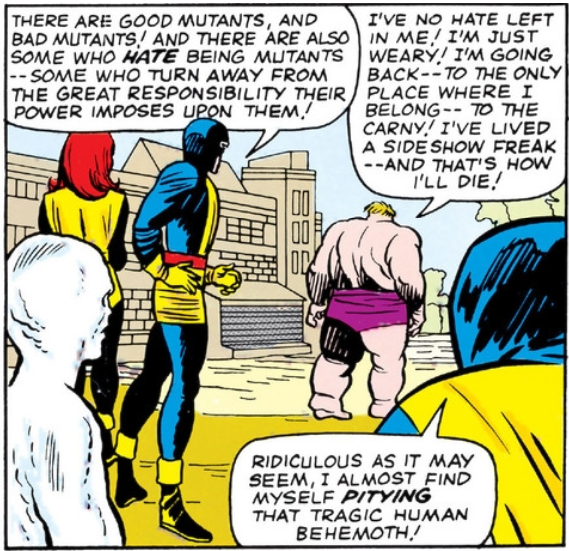 The takeaway here is that life is rough for a mutant in 1964. Your choices are pretty limited: you can either get the crap kicked out of you by the X-Men and Magneto, or take your chances as a carny. It’s hard out there for a blob. Exactly what are Magneto’s powers? He can, so far, demonstrate total (and pretty much telekinetic) power over any object that is even remotely magnetic (this includes rocks and people). But also, he can project himself metaphysically across great distance (just like Xavier can) and communicate telepathically (just like Xavier can). What are mutants? Traditionally, they’re considered the “next generation of homo superior,” right? But in this issue, Namor—an Atlantean—is identified as a mutant which would indicate—one would think—that, by extension, all Atlanteans are mutants, no? And if that is the case, then that kind of upsets the idea of mutants being the next anything. Is there any reason to think Atlanteans are not older than humans? Maybe Mutants are the originals, and humanity is the next step. Maybe it’s devolution, not evolution. Or maybe it’s just not thought out. 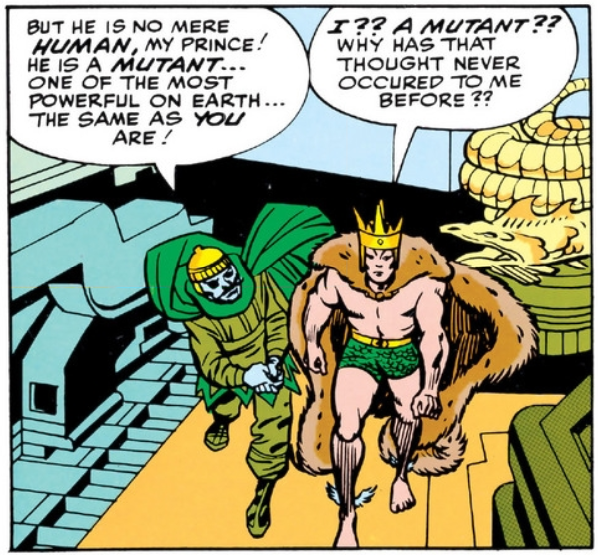 But in this issue Xavier and Magneto are both immediately pretty accepting of the idea that the prince of the undersea kingdom of Atlantis could be a mutant. Which. doesn’t. make. sense. None of this matters much because the point of this comic book series (up through now) seems to be pretty much just to facilitate fun. And it really is doing a bang-up job so far. Issue Six begins at home, with the X-Men clowning around a table set with a meal cooked by Jean. The requisite light comedy is enacted before Xavier retires from the scene. He withdraws to his study and, quite matter-of-factly—enters a trance state, whereby he projects a shade version of himself under the OCEAN(!) 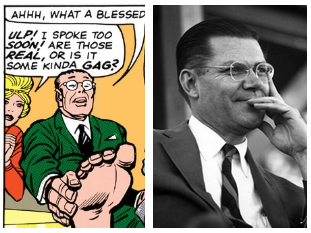 to seek out the never-before-mentioned (at least in The X-Men so far) character of Namor the Sub-Mariner. It’s not much of a surprise that these panels are the most beautiful and energetic of the issue. It’s pretty openly psychedelic. However, Xavier leaves his tasked unfinished when he “senses” Magneto nearby, doing exactly the same thing. Again, how Magneto’s magnetic power allows him to do this is pretty unclear. It’s like if you were really good at badminton, and that somehow also enabled you to cause earthquakes with your mind. 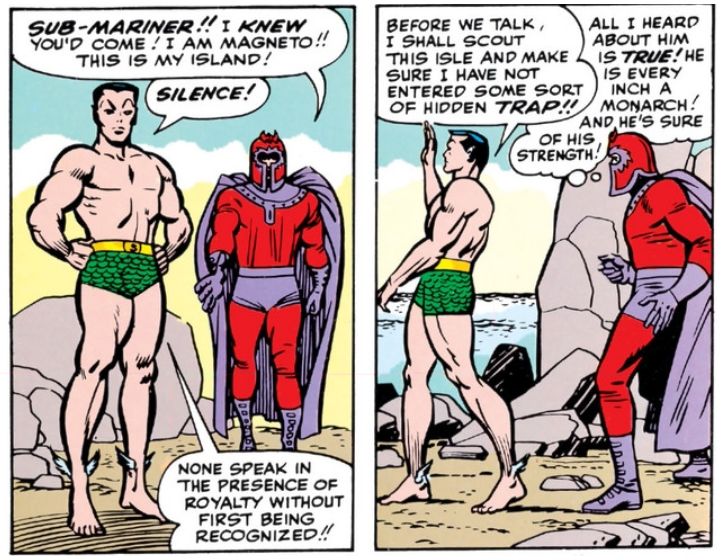 So anyway, Magneto gets to the undersea king first. Namor, it should be said, is really the star of this issue by the way. It’s clear from the editorial notes that this is a character who has recently shown up in Fantastic Four where he both antagonized the team and romanced its matron. So is he a villain, a hero, neither? Neither with a capital N.
There’s an impressive amount of tension in this issue. The X-Men and The Brotherhood of Evil Mutants are in pursuit of the same “mutant.” Namor is courted by, then pitted in battle against, both the Brotherhood of Evil Mutants and the X-Men. The Scarlett Witch finds herself crushing on the underwater dude and also beginning to question the infallibility of her leader Magneto. 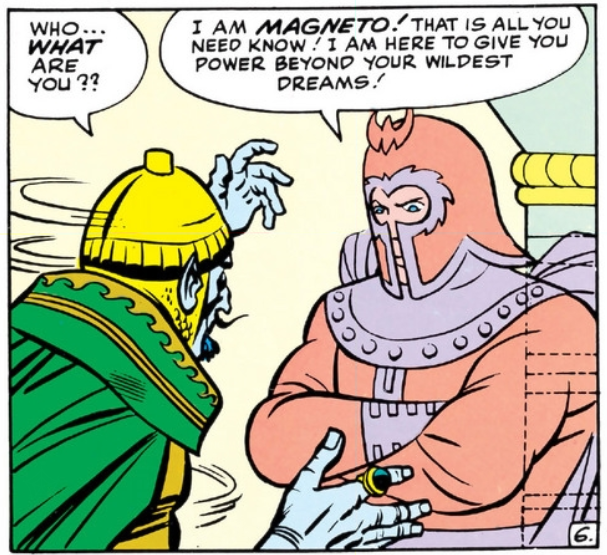 Magneto is subsequently doubted and tested by nearly each of his underlings. And Jean Grey (abruptly) reveals herself to be jealous of the Scarlett Witch’s beauty. Not much happens to or changes with our X-Men here. In this issue, they’re actually very much in the background for most of the narrative. 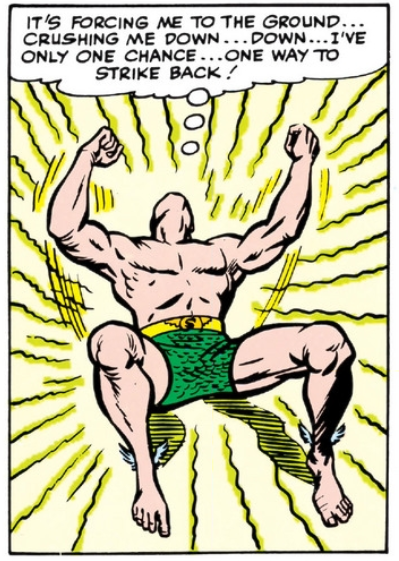 The stars are, again, Jack Kirby’s utterly vibrant art and Marvel’s seaguy Namor—who, it should be said, comes across as a pleasantly dimensional chap. In a mere handful of panels he displays royal surety, pettiness, rage, and forlornness. It will be fun to see if (and how) the X-Men themselves dimensionalize to the same degree.